In this cinematic climate, where release dates are staked out years ahead of time, it's easy to get ahead of ourselves, especially when it comes to Marvel movies. For example, James Gunn recently confirmed that he will come back to both write and direct Guardians of the Galaxy 3, while fans await the release of Guardians of the Galaxy Vol. 2, arriving in theaters May 5. While Guardians 3 is still a long ways off, the filmmaker recently teased that if a Guardians 4 were to happen, it would feature a much different team. As of now, all we know is that Guardians 3 will be part of the Marvel Phase 4 lineup, but if a Guardians 4 were to happen, that may be held off until Phase 5. It's possible that Guardians 4, which still has not been confirmed by Marvel yet, may debut late in Phase 4, but that all depends on how many movies Marvel is planning to release in their Phase 4 slate. 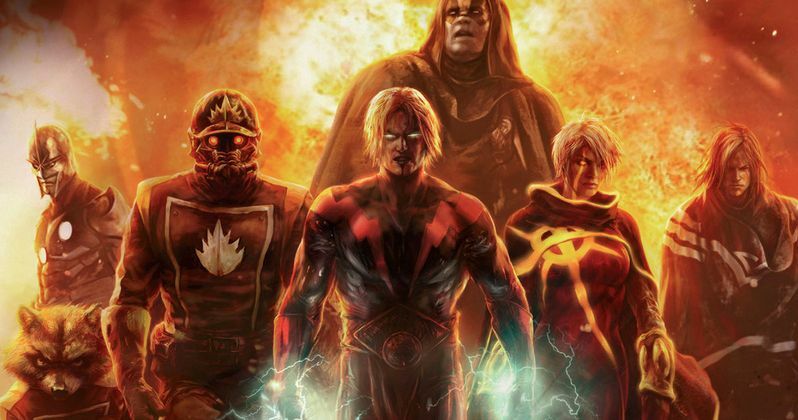 During an interview with The Toronto Sun, James Gunn confirmed that there is a trilogy arc in place for these current Guardians, and that a fourth movie would in fact feature a different team. "I think the first three movies tell a single story and that story is pretty simple. I think that there could be a Guardians Vol. 4, but it would not be the same. It would not be the same group... basically the story of this group ends with Vol. 3." Many have speculated that a number of Marvel characters will be killed off in Avengers: Infinity War, paving the way for other characters to take over as new versions of heroes such as Iron Man, Captain America and many more. We'll have to wait until Avengers: Infinity War hits theaters next year to see what the studio has planned, but James Gunn may have even given fans a hint about what this new team may be. It was confirmed that one of the many Guardians 2 post-credit scenes features the original Guardians lineup from the comics, which includes Stakar Ogord (Sylvester Stallone), Aleta Ogord (Michelle Yeoh), Charlie-27 (Ving Rhames), Krugarr, Mainframe (Miley Cyrus) and Martinex (Michael Rosenbaum). When asked about the future of Stakar Ogord in the MCU, James Gunn teases that fans will definitely see more of him. "My plan is to see more of him. I'm not sure about him appearing in Vol. 3, we'll have to see about that, but it's our plan to see more of Stallone. Kevin (Feige) and I are working on what is going to become of the Marvel Cosmic Universe and where it's going to go. We plan to see the rest of them in the future. I will be helping to plant the seeds that will lead to the next decade. I'm helping to decide what projects we'll be pursuing outside of Guardians of the Galaxy Vol. 3... and what the next cosmic characters we will focus on. It's my plan to have Sly, and I talked to him last night, to find a place for him in the future of the Marvel Universe." While it's possible that the original Guardians could take over as the main focus of Guardians of the Galaxy 4, it's also possible that movie may be directed by a new filmmmaker. Before finally deciding to return to write and direct Guardians 3, James Gunn was undecided for quite some time, and it's possible that this may be his last Marvel movie, but that has yet to be confirmed. Hopefully we'll find out more about both Guardians 3 and Guardians 4 in the very near future.